Gabrielle Union flashes a big smile alongside her hubby Dwyane Wade while arriving at Hallmark’s When You Care Enough to Put It Into Words Launch Celebration held on Monday (July 30) in Los Angeles. The 45-year-old actress and Dwyane, 36, was joined at the event by Claws‘ Karrueche Tran, Jodi Lyn O’Keefe, Lethal Weapon‘s Kevin Rahm, Keesha Sharp and her hubby Bradford and Johnathan Fernandez. Also in attendance was Days of Our Lives‘ Galen Gerings, Big Bang Theory‘s Kunal Nayyar, and America’s Funniest Home Videos host Alfonso Ribeiro and his wife Angela Unkrich. At the event, Gabrielle served as hostess for the evening and debuted her episode of Hallmark’s new docu-series where she pays tribute to Wade and their love. FYI: Gabrielle is wearing a Sally Lapointe dress. Karrueche is wearing a Rhude shirt. Jon Hamm, January Jones, & Christina Hendricks Make It a 'Mad Men' Reunion! Jon Hamm and his Mad Men co-stars were all smiles at a cast reunion last night! The 45-year-old actor suited up for the launch of creator/writer Matthew Weiner‘s book “Mad Men” at TASCHEN Store on Thursday (February 23) in Beverly Hills, Calif. They were joined by January Jones, Christina Hendricks, Kiernan Shipka, Jessica Pare, Ben Feldman, Kevin Rahm, Sheila Shaw, Linda Brettler, producer Jerry Bruckheimer, and costume designer Janie Bryant. Matthew gave a toast alongside the cast and crew before the group signed copies of the book to give away. FYI: January is wearing a SMYTHE coat. Jessica is wearing an alice + olivia by Stacey Bendet dress. Jordana Brewster & 'Lethal Weapon' Cast Celebrate Premiere - Watch Trailer! Jordana Brewster is all smiles as she hits the red carpet at the screening premiere party for her brand new show Lethal Weapon held at NeueHouse Hollywood on Monday (September 12) in Los Angeles. The 36-year-old actress was joined at the event by her co-stars Clayne Crawford, Damon Wayans, Dante Brown, Johnathan Fernandez, Keesha Sharp, Chandler Kinney, Kevin Rahm and Michelle Mitchenor. The iconic cop duo Riggs (Crawford) and Murtaugh (Wayans) are back in the all-new Fox series Lethal Weapon. 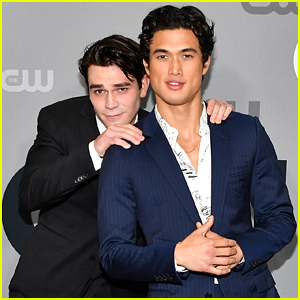 Don’t miss them as they work in a crime-ridden modern-day LA when it premieres on Wednesday (September 21) – Watch the trailer below! FYI: Chandler is wearing an Alice & Olivia dress, Tamara Mellon shoes, and a Kate Hewko choker. Jordana is wearing a Tory Burch dress and shoes with a Dana Rebecca Designs ring. Kylie Bunbury and Jordana Brewster meet up with their cast mates during the 10th Annual PaleyFest Fall TV Previews honoring FOX’s Pitch and Lethal Weapon held at the Paley Center for Media on Thursday night (September 8) in Beverly Hills, Calif. The two actresses joined Mark-Paul Gosselaar, Mo McRae, director Paris Barclay executive producer Kevin Falls, Johnathan Fernandez, Clayne Crawford, Kevin Rahm, Keesha Sharp, and Damon Wayans, Sr. to talk about their new Fox shows. Lethal Weapon and Pitch premiere in two weeks on Fox. FYI: Mark-Paul is wearing Timberland boots. 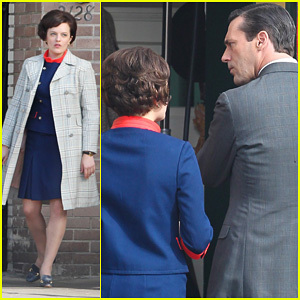 Elisabeth Moss: 'Mad Men' Set with Jon Hamm! Elisabeth Moss goes retro as she arrives on set of her show Mad Men on Tuesday (December 4) in Los Angeles. The 30-year-old actress was joined by her Mad Men co-stars Jon Hamm, Aaron Staton, Vincent Kartheiser, Christina Hendricks, and Kevin Rahm while filming scenes at Little Dom’s restaurant. Season six of the hit AMC drama is set to begin early next year!